With more and more news referencing eNotes and eVaults, an influx of industry players coming to the “eClosing” table, webinars, educational initiatives and the announcement of HousingWire’s 2018 Top 100 list, there is an undeniable momentum surrounding the digital revolution of the mortgage industry. Thanks to this accelerated sense of growth, eOriginal has enjoyed an exciting few weeks. Here are some highlights. MERSCORP Holdings, the owner and operator of the MERS® eRegistry, identified several gaps that needed to be addressed to increase eNote adoption. As a result, MERSCORP Holdings has launched the MERS® eNote Solutions, part of the MERS® eSuite. The solution, which is powered by eOriginal, enables thousands of originators to realize the benefits of a digitally executed promissory note at the closing table. On April 2nd we received the honor of being included in HousingWire’s 2018 HW TECH100™. This is the only tech innovation ranking that captures the entire U.S. housing economy, spanning real estate to mortgage lending, servicing, and investments. According to HousingWire, the quantity of applicants for the 2018 awards increased from previous years. The final list of 100 companies demonstrates the depth and range of technology solutions available to those operating in the housing economy. Rock City, Here We Come! On Sunday, the eOriginal team will touch down in Detroit for MBA Tech 2018. We’re looking forward to a dynamic time of networking and participating in industry conversations. 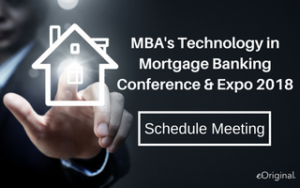 We will also be sharing eOriginal’s Digital Mortgage Solution as part of the Tech Showcase on Monday the 16th at 2 p.m. and presenting in the Commercial Real Estate demonstration at 3 p.m. If you’re attending MBA Tech 2018, don’t forget to include us in your itinerary! We’ll be at booth 219 in the exhibit hall and we’d love to have a more in-depth conversation with you. This entry was posted in Digital Mortgage, News and tagged MBA Tech, MERSCORP Holdings.